Do-It Corporation’s Printed R-GED Fold-Up Hang Tab provides several benefits for Goat Head Sole Spikes round container. 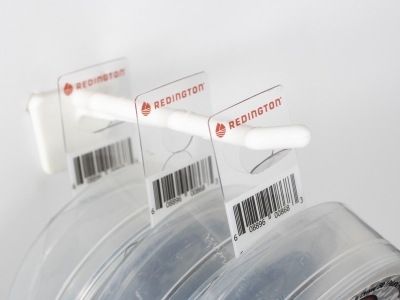 The GED hang tab allows Redington to eliminate the entire paperboard header. The fold-up hang tab lies flat during shipment and stays flat if the product is placed on a shelf or in a bin. This approach also allows for smaller master carton packaging. In addition, the GED easily folds up for hanging the product on a peg hook or display strip. The hang tab is also digitally printed with Redington’s logo and a bar code. Do-It’s R-GED Hang Tab succeeds in providing a simpler, cleaner approach to retail display for Goat Head Sole Spikes.